Local (OK, ex-pat local) poets and writers performed on this an upbeat and fun night followed by an open mic. On this special 2nd-Monday-of-the-the-month reading. 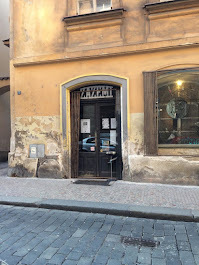 Alchemy was pleased to present two rockus Czech poets, Simon Safranek and Viki Shock, visiting from their new home in Berlin. They performed work in English and Czech. 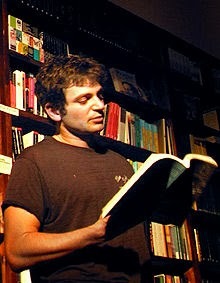 Another special guest, Peter Orner (below) read from his recently published book of short stories "Esther Stories". 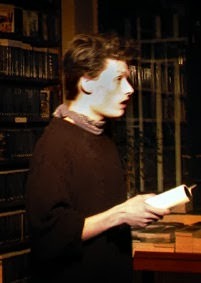 Peter, who has lived in Prague in recent years, now lives in Rome. 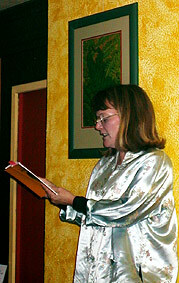 Jeri Theriault's poems have appeared in many North American lit mags over the past fifteen years. She has two chapbooks: Corn Dance (Nightshade Press, 1994) and East of Monhegan published during her Fulbright year (1998-9) in Prague. A third chapbook Catholic is forthcoming from Pudding House Press. Last year she earned third place in the Allen Ginsberg contest sponsored by the Poetry Center in Paterson New Jersey. 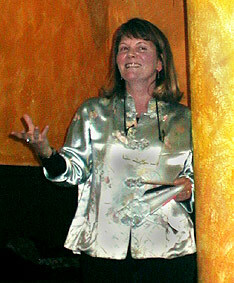 Theriault currently resides in Prague where she's writing trampoems and teaching at the International School of Prague.